Instant messengers are part of our life forÂ most ofÂ us. They are used in one form or other by most of us for day to day conversations with friends, relatives, coworkers etc. May be few of you may have noticed if not majority , that the chat over these IM clients like yahoo messenger, MSN live messenger and many more are done with unsecured network. This means that any one having a good enough technical know how about the way IM clients work can get through your personal messages / conversations by a bit of hacking stuff. That’s why, we need something which can encrypt our conversations so that only the intended person can read the messages/chat. 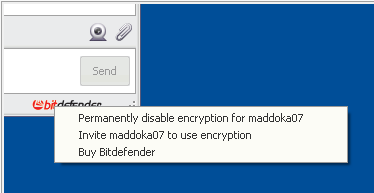 Bitdefender Chat encryption is a tool from Bitdefender which helps you secure/encrypt your Chat/messages. IT is a standalone application different from its antivirus product which can be installed on any computer with any other antivirus product with almost no compatibility problems. The setup file for this is a bit big though i.e. 12.6 MB in size. It can be installed in a breeze. A icon appears in your chat window at the bottom from where you can enable or disable it as per your requirement. 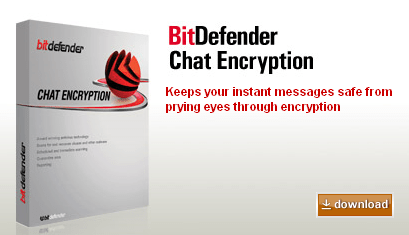 BitDefender Chat Encryption keeps your instant messages safe from hijacking through a simple and automatic encryption process. This tool.delivers IM privacy in a snap by securing all your communications via Yahoo! Messenger 8 and Windows Live Messenger 8.5. For encryption to work, it should be installed on both the systems though between which the conversation is made. But that’s not a big deal , as this doesn’t cost a dime.